Resting long enough to maximize your training volume could be the key to success, i.e. strength and size gains. If you have been following the various affords to ascribe differences in strength and, even more so, size-increases to a specific training variable, you will remember that the only promising parameters that appear to be supported by more than the literal "outlier study" are training load and volume. Of these, the former is pretty much uncontested. The latter, however, is still questioned by a camp of inconvincible skep- tics, who simply ignore the fact that there's ample evidence that "[h]igher-volume, multiple-set protocols have consistent- ly proven superior over single set protocols with respect to increased muscle hypertrophy" (Schoenfeld. 2010). What still isn't clear, though, is the role of other training parameters, such as the time you take to recover between multiple sets and exercises aka the "rest intervals". As Schoenfeld et al. point out in the introduction to their most recent study, "several studies have investigated the effects of varying rest interval length on muscular adaptations," (Schoenfeld. 2015) albeit with contradictory results: While Ahtiainen et al (2005) were unable to find a significant inter-group size or strength difference in well-trained subjects (6.6 +/- 2.8 years of continuous strength training) who rested 2 minutes compared to those who rested only 5 minute in response to their 21-week training intervention, Buresh et al (2005) reported more recently that significantly greater size increases of the arms and a trend for greater muscle hypertrophy in the legs in young, albeit untrained subjects who rested for 2.5 minutes instead of just one. Figure 1: Previous studies found "conflicting" evidence. While Ahtiainen et al. found no effects of 2 vs. 5 minutes in trained, Buresh et al. found effects of 2 vs. 1 minutes rest in untrained subjects. With different subjects, different workouts and most importantly different rest times that were compared it is yet not exactly right to say that the studies contradict each other. Now, obviously, the ostensible "contradiction" I alluded to in the previous paragraph does eventually not exist. With trained vs. untrained subjects, different workout protocols and most importantly different rest intervals (1 vs. 2 minutes and 2 vs. 5 minutes) the studies by Ahtiainen and Buresh cannot really contradict each other. The same must be said of an even more recent study by Villanueva et al. (2014) the surprising findings of which, i.e. "longer rest periods compromise the gains of older trainees", I've discussed last year, already. What about the lack of different increases in strength endurance? I have to admit that I do not discuss this finding of the study in detail. While one would expect that shorter rest intervals would produce greater strength endurance adaptations, the researchers observed the opposite, an - albeit non-significantly larger increase in strength endurance in the 3-minute-rest group that correlated with the increase in 1RM strength. Further studies will have to show what the underlying mechanism of this counter-intuitive observation is and whether it may be muscle specific, i.e. occur only in the upper, but not in the lower body. "[c]onsistent with generally accepted guidelines on the topic (Willardson. 2006), we hypothesized that short rest intervals would produce greater increases in muscle growth and local muscle endurance while long rest intervals would result in superior strength increases" (Schoenfeld. 2015). As you will know if you didn't miss the headline of this SuppVersity article, this hypothesis was only partly validated. The data in Figure 2 confirms that the subjects, "experienced lifters (defined as consistently lifting weights for a minimum of 6 months and a back squat / body weight ratio ≥ 1.0)" (Schoenfeld. 2015), gained significantly more strength, when they rested 3 versus just 1 minute between the 3 sets of their three weekly workouts (Figure 2 does also tell you that the strength endurance increases were identical in both groups). Figure 2: Changes in markers of strength and strength endurance; * denotes significant pre- vs. post difference, # denotes significant inter-group difference (here in favor of long(er) rest periods | Schoenfeld. 2015). This is a highly significant result even for you who is - according to an older SuppVersity Poll - probably training according to a split regimen, albeit most likely with very similar exercises. What may be different from the some, but obviously *smile* not your workout though, is that the supervision by members of the research team ensured that the subjects stuck to the prescribed cadence of 1 second for the concentric and "approximately 2 seconds" (ibid.) for the eccentric part of every the exercise. This as well as the imperative progression to higher weights, whence the prescribed number of 8-12 reps per set could be performed is unfortunately overlooked by many recreational trainees - with disappointing consequences in the form of inferior or even no size and strength gains, by the way... but I am digressing, let's rather take a look at the already mentioned, unexpectedly superior strength size gains in the long(er) rest interval group (Figure 3). Figure 3: Changes in muscle thickness and corresponding effect sizes; * denotes significant pre- vs. post-changes, # denotes significant inter-group differences; overall it is obvious that there's a long(er) rest advantage (Schoenfeld. 2015). As the single "#" in Figure 3 tells you, the inter-group differences and thus the advantage of the long(er) rest intervals was statistically significant only for the quads, though. If we also take into account the lack of statistically significant effects on the sleeve sizes (biceps and triceps) in the short rest interval group, as well as the obvious differences in effect sizes (Figure 3, right), there's yet little doubt that the hypothesis that shorter rest intervals yield greater size increases must be considered falsified - at least under the given experimental conditions (trained subjects, three full-body workouts per week, standard hypertrophy set and rep-ranges, etc.). So what's the verdict, then? At first sight it would appear as if the study at hand would totally refute the idea that shorter rest intervals, or I should clarify, rest intervals that are as short as 60s (*) should have a place in your training regimen altogether (*Schoenfeld, et al. rightly point out that Ahtiainen's result suggest that even 120s could have been enough time to rest - it is thus important to give precise recommendations for rest intervals, not something as arbitrary "short" vs. "long"). We should not forget, though, that even a thoroughly conducted study like the one at hand has its limits and definite conclusions should not be drawn hastily based on a single study result - even if it is, as in this case, corroborated by the results of Buresh et al (2009). 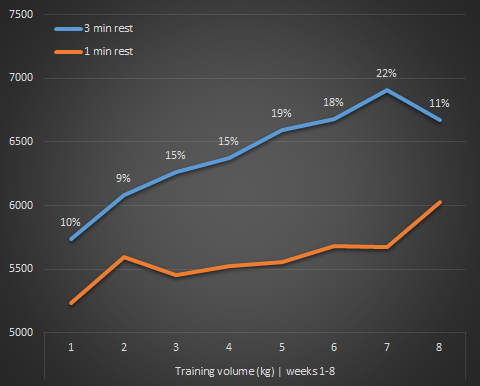 Figure 4: The total training volume in the long(er) rest period group (3 vs. 1 minutes of rest) was on average 15% higher. Due to the relatively high inter-individual differences and the relatively low number of participants (N=21) a statistically significant correlation between the weight lifted per week (total volume in kg as in the figure) and the surprisingly superior gains in the 3-min-rest group could not be established (based on Schoenfeld. 2015). With that being said, a secondary outcome of the study provides a reasonable explanation for why both, the strength and the size gains benefited from long(er) rest intervals: The total training volume I've plotted in Figure 4. As Schoenfeld et al. point out, the latter has previously been suspected to mediate the effects of inter-set rest on strength and hypertrophy on total training volume and strength (Henselmans. 2014). A correlation between the visible differences in training load (see Figure 4) and the magnitude of training adaptations, however, could not be found in the study at hand. As the authors highlight, the reason for this lack of statistical significant correlations may yet be a simple lack of statistical power, so that one "cannot rule out the possibility that the greater training load achieved by the longer rest period group was responsible for the greater training adaptations" (Schoenfeld. 2015 | Buresh et al. found such an effect for the upper, yet not for the lower body). 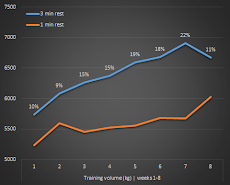 Personally, I tend to believe that, with a higher number of subjects, a correlation between the total training volume that was on average 15% higher in the 3 vs. 1 minute rest group could have been established. This, in turn, would support the notion that long(er) rest periods - maybe, as Schoenfeld et al. suggest based on the data from Ahtiainen's study, at least 120s - are necessary to maximize the total training volume and thus the overall = strength and hypertrophy response to workouts. Whether that is true for all types of workouts (e.g. split- vs. full-body), all subject groups (e.g. people who are used to short rest periods vs. those who are not) as well as special athletic requirements (e.g. power vs. strength & hypertrophy) will have to be determined in future studies, however | Comment on Facebook! Ahtiainen, Juha P., et al. "Short vs. long rest period between the sets in hypertrophic resistance training: influence on muscle strength, size, and hormonal adaptations in trained men." The Journal of Strength & Conditioning Research 19.3 (2005): 572-582. Buresh, Robert, Kris Berg, and Jeffrey French. "The effect of resistive exercise rest interval on hormonal response, strength, and hypertrophy with training." The Journal of Strength & Conditioning Research 23.1 (2009): 62-71. Henselmans, Menno, and Brad J. Schoenfeld. 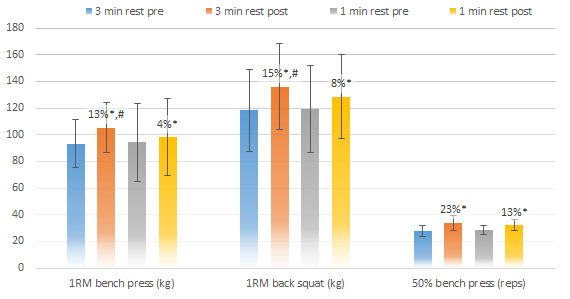 "The Effect of Inter-Set Rest Intervals on Resistance Exercise-Induced Muscle Hypertrophy." Sports Medicine 44.12 (2014): 1635-1643. Schoenfeld, et al. "Longer inter-set rest periods enhance muscle strength and hypertrophy in resistance trained men." Journal of Strength and Conditioning Research (2015): Publish Ahead of Print. Villanueva, Matthew G., Christianne Joy Lane, and E. Todd Schroeder. "Short rest interval lengths between sets optimally enhance body composition and performance with 8 weeks of strength resistance training in older men." European journal of applied physiology (2014): 1-14. Willardson, Jeffrey M. "A brief review: factors affecting the length of the rest interval between resistance exercise sets." The Journal of Strength & Conditioning Research 20.4 (2006): 978-984.